Mount Vernon is the home of George Washington, located just south of Washington, D.C. in Virginia. Privately owned by the Mount Vernon Ladies Association (MVLA), it is the oldest historic preservation organization in America founded in 1853. Mount Vernon welcomes over 1.1 million guests through its doors each year under the mission of honoring the life and legacy of the first president of the United States. In 2017, Mount Vernon also welcomed 8.6 million guests virtually through their web platforms, providing high-quality educational content on George Washington and the founding era. The Mount Vernon web platform is growing yearly at a rate of 20%. In 2017, Mount Vernon served 20 million page views, 48% of which were from mobile devices. In order for the MVLA to keep up their mission of education and outreach, they rely on technology providers to ensure their our content stays at the top of search engines and remains relevant to those seeking information. As a non-profit, Mount Vernon has very little funds dedicated to outbound marketing for educational content. Because of this, Mount Vernon’s content marketing relies heavily on Google search in order for their content to be found easily and at little to no cost. While on a budget, Mount Vernon diligently works to improve the content they provide so that it is always high-quality, including being on top of technology trends that influence search results. In 2016, Mount Vernon made a concerted effort to optimize content for mobile devices and in 2018, image optimization will complete these efforts. Mobile traffic is a growing demographic for Mount Vernon. In 2017, mobile visitors ranged from 48%-68% of their website traffic depending on the time of year (highest mobile visits are during the summer months because people are Google searching while on vacation). In comparison, Mount Vernon had an average of only 36% mobile visitors during 2016. In other words, mobile visitors increased 12-32% in one year. Previously, Mount Vernon was relying on an in-house solution of developing image derivatives and cropping them for each screen size of the many mobile devices visiting their site. With the ever-growing range of mobile devices on tablets and smartphones, how could Mount Vernon keep up with the increasing demand of mobile devices while keeping its budget low? There is an ever-changing array of devices that are released to the public daily —small phones, bigger phones, tablets, mini-tablets, large tablets, TVs and more —all with different screen sizes and resolutions. George Washington’s Mount Vernon found a technically savvy and cost-effective solution to this problem with ImageEngine by ScientiaMobile. 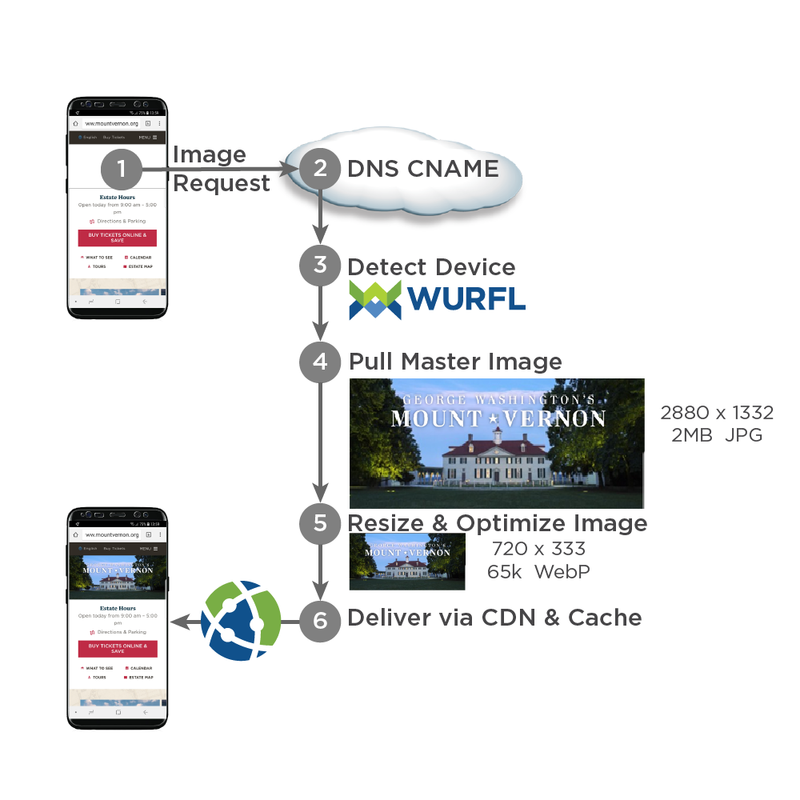 The Mount Vernon team found ImageEngine worked with their highest resolution and largest images, optimizing for each user based on the capabilities of their device. ImageEngine eliminated the complicated work of creating all of the different sizes needed to deliver the most lightweight and efficient browsing experience. Plus, there is no maintenance required as ScientiaMobile’s WURFL device detection is constantly being updated and the same device intelligence is passed along to its ImageEngine product users. On top of saving the time of maintaining an image database or device repository, ImageEngine was a cost effective solution for Mount Vernon because they only paid for image payload that was optimized. George Washington’s Mount Vernon digital collection hosts their most image intensive displays. By adding ImageEngine, they improved their desktop Google PageSpeed score by 13 points and their mobile score by 11 points simply by leveraging the service. What’s more, Mount Vernon’s most important goal of improving their Google search ranking was easily attained with a simple DNS CNAME that redirected image URLs through ImageEngine. Previously, Mount Vernon was using Amazon S3 which helped them reach a local, Northern Virginia online audience, which was not ideal for website visitors from outside of the Mid-Atlantic. With ImageEngine, they found that their site is now fast for all website traffic, regardless of vicinity to Northern Virginia. This is especially important for increasing potential interest in tourists and students from all around the world. Before ImageEngine, Mount Vernon’s Content Management System (CMS) performed image cropping and their site had an average 3.2 MB page load weight. With ImageEngine, they found their page weight dramatically dropped down to 700 kb. This tremendous decrease in page weight of over 74% created a much more pleasing experience for all site visitors, but especially for mobile tourists. Often tourists and students would access the Mount Vernon website while on mobile connections with limited bandwidth. The faster load time provided a much better mobile user experience for these tourists. A better user experience improved their enjoyment and knowledge of the time period. With ImageEngine, George Washington’s Mount Vernon developers no longer have to worry about cropping images or derivatives. They have peace of mind knowing that ImageEngine will always serve up the best possible image for every device. And as tourists’ internet speeds or devices improve, they don’t have to worry about maintenance costs required to keep up. George Washington’s Mount Vernon saw a tangible increase in revenue from ImageEngine. They found that when someone visits their virtual tour webpage, they see an incremental $0.02 increase in ticket sales. The increase in mobile traffic from both inside and outside of the Northern Virginia area has increased their website traffic, thereby increasing ticket revenue.